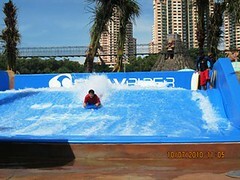 Experience the Flowrider @ Water Park on weekdays from 11am to 6pm except Tuesdays and 10am to 6pm on weekends. Each rider is only allowed five minutes before the whistle is blown for the next person to come in. Riding the stationary “sheet wave” is like riding the wave in the ocean. Riders can slide down and ride up the wave surface, carve turns and do stunts like the 360° flips.